The world of coding has exploded in recent years thanks to a neverending supply of tech geniuses making news apps and earning billions. While not all of us will become the next Gates or Zuckerberg, careers are plentiful and the opportunities are endless. One of the most popular careers in the coding space is as a software engineer. These coders work on a variety of tasks, from the apps and software people use every day, to the operating systems that let these programs operate. Software engineers are great problem solvers, like to think outside of the box, and work in a constantly changing environment. Sound like fun? 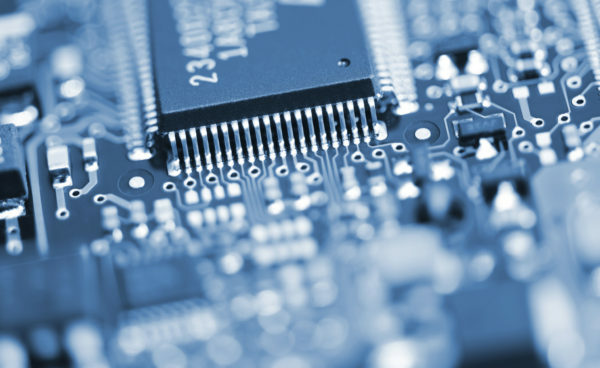 Read on to find out about a career as a software engineer! Careers in software engineering are growing at a rapid pace – 17% over the next 10 years to be exact. This number could jump even higher as more people become concerned about computer security and require software to protect their information. This doesn’t mean you need to be a computer science major either, there are countless of free programs online to teach you programming (like Codeacademy), or you can check out a coding bootcamp. 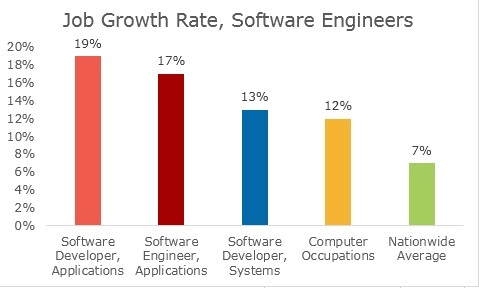 Compared to the average job growth rate among all industries, software engineering is a safe bet to land a job in the future. When you think of coding you generally think of Silicon Valley, but that isn’t the top area for software engineer employment – New York City has the most software engineers at over 54,000. The majority of the top cities hiring software engineers are on the coast though, so if you intend on living further inland, a job in software engineering may not be for you. Although it’s true that every company needs a technology presence now, that doesn’t mean each company has a full time tech staff. Many companies will hire a technology firm for contracted work to help them with their current goals, such as a new website or app. 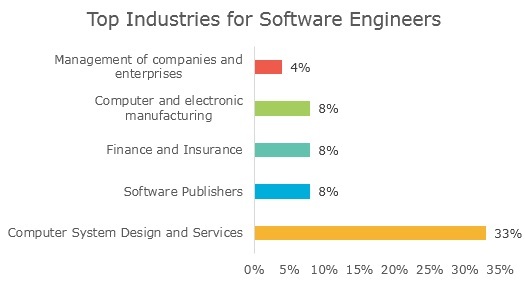 As can be seen in the chart below, 33% of software engineers work in design and other services, while only 4% work directly in company management of technology. Due to high demand it’s not surprising that software engineers receive large salaries for their work. The median salary for an entry level software engineer is $75,275. This salary will jump as you gain experience too – according to the Bureau of Labor Statistics the average salary for a software engineer is $100,690. You shouldn’t expect to be home by dinner as a software engineer, 44% of engineers work after dinner. On average, software engineers work an average of 8.5 hours a day, higher than the national average of ~7 hours. Interested in learning more about a career in software engineering? Check out our guides on working at these top tech companies – Facebook, Google, Apple, Amazon. Looking for more help in finding the right career for you? TransparentCareer offers free data on career pathing, salary negotiation, and compensation packages. Sign up for free here.